Modern society requires tools for the measurement and characterization of everything from biological cells to large structures. It is important to be able to determine the properties of many different materials, from biological tissue and polymers all the way through to construction materials and dynamic machines. This research group specializes in technologies and models for determining material properties, the use of modern sensors and microscopes to measure surfaces, the ways to image below the surface of materials, and to predict what will happen in the future. We are also interested in precision machines and mechanics. There are many ways to characterize a material surface or an internal structure. One good example is the methods by which a cell can be characterized, in terms of its shape and size, but also its mechanical properties. Instruments such as atomic force microscopes can be used for this purpose, but optical techniques are becoming increasingly important in providing not just information on structure, but also to provide optical tweezers to move cells around. In all such measurements, precise knowledge of the dynamic movement and location of different components of machinery is important – a key skill of members of this research group. Precision metrology is also an interest. The knowledge of material properties is important in many engineering disciplines, such as the design of lightweight gearboxes, where the wear of surfaces is important. Imaging of internal structure is also important – the mechanical properties of a material or structure will depend on variations within the structure. 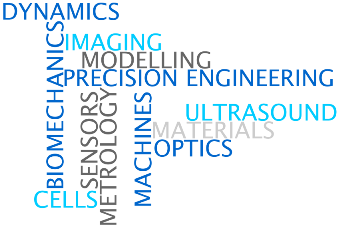 The group specializes in optical and ultrasonic techniques for this purpose, and there is active research on the imaging methods that can be used for imaging both within the human body, and also for industrial materials, including concrete and metals. The research group has links with many other research institutes, both within the UK and across the world. We work closely with industry on many projects, and interact with other research groups across both the School of Engineering at Warwick, and across the Warwick campus.